Tom Mays Unit is open from 8 am to 5 pm daily. The park opens early at 4 am on race day. Off-hours access is permitted and is via a small parking area at the gate off of Transmountain. Overnight camping is available. A ranger station, usually only staffed on weekends in the warmer months, is located a mile inside the entrance. Adult entrance fees are $5 per person or $2 in groups; children 12 and under are free. When the station is not staffed, use the pay box next to the station. The largest urban state park in the country, Franklin Mountains State Park drives a three thousand foot tall wedge through the city of El Paso. The mountains host well over a hundred miles of trails, climbing through foothills and traversing much of the ridgeline. 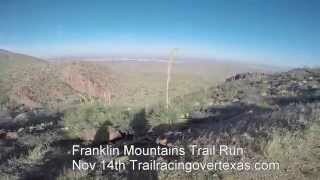 Overshadowed in popularity by better-known races in Albuquerque and Phoenix, the Franklin Mountain Trail Run is a unique, hidden gem in the desert. The 50k course highlights the best trails found north of Transmountain Drive, a highway bisecting the mountain range and connecting the two sides of the city. The western side has long views into the Mesilla Valley and Chihuahuan Desert. A climb to the summit of the mountains takes the race to North Franklin Peak, offering a 360-degree panorama of Texas, Mexico, and New Mexico. The east side crosses through a lush desert forest of sotols, agave, and cacti, connecting back to the west side via a canyon route. As one would expect, the course is very rocky. Trail shoes with good rock plates are a necessity. Erosion from thunderstorms can cause trail damage, but the race course generally sticks to well-maintained paths. While the weather in mid-November is cooler than the height of summer, temperatures can still reach well into the 70's during the day time. There are no trees or shade to be found on the run, and the hot, dry weather can dehydrate runners unfamiliar with the desert more quickly than other climates. Be sure to bring enough water to last between aid stations. fast downhill descent on Lower Sunset before turning onto the steep and challenging Schaeffer Shuffle, one of the area's signature trails. The Shuffle features the steepest segment of the entire race, drawing inexperienced runners into burning too much energy early on. Step carefully on the slippery talus segments. Take in the views of New Mexico to the west and the banded mountains to the east, but pay attention to the trail - rocks and cacti are ever-present obstacles. As the trail descends back down to the valley, it rejoins Lower Sunset and continues in a counterclockwise direction. The path features a variety of terrain, from a former gravel access road to a narrow cliffside path to roller coaster, rocky singletrack. The course joins the access road briefly and then begins a climb to the top of the Franklins at North Franklin Peak. This is the most challenging part of the race, climbing more than two thousand feet over the next four miles. The trail crosses some large sections of scree, eroded off the mountains over millions of years. Use extra caution on these portions. A lonely ham radio repeater marks the top of the mountain and where the race U-turns in a descent to the east side. Settling back at the bottom a little after the fifteen mile mark, the trail passes the ruins of a former tin mine. It is the only one of its kind in the United States, but it ended operations nearly a hundred years ago after it was found to be unprofitable. The next six miles, between Scenic Road, Sotol Forest, and Newman Trail, are a fun, scenic run through areas of thick desert plant life. Few areas of the Chihuahuan Desert feature the wide range of vegetation found here in the foothills. The course turns west around the twenty-mile point, passing along the southern edge of Hitt Canyon. An arroyo is sometimes visible below. This section of trail, only recently built, makes the loop course possible. After a hairpin descent of a few hundred feet, the race then connects to the flat, meandering Bike Loops on the west side. This is the easiest portion of the run, and provides an opportunity to pick up speed for a few miles. As the trail transitions from desert flatland back to the foothills, it rejoins Lower Sunset in the opposite direction and makes one final climb back to the start line. The course feels longer than the nearly thirty two miles it covers - the rocky, desert terrain is demanding and unforgiving. Completing the run is an true achievement. Desert plants tend to bloom in waves in spring and summer after the short periods of rain that El Paso experiences. Ocotillo tend to turn green and blossom first, followed by barrel and claret cup cacti, and finally flowers and prickly pears. Animals are mostly limited to jackrabbits, lizards, and small birds. Roadrunners will dart across the trail at times, and hawks circle overhead, looking for prey. Coyotes are hard to spot and tend to only come out after dusk, although they leave runners alone. Keep an eye out for snakes. They avoid the hot desert sun and are more common during the winter months. Most are harmless, but rattlers are a part of the local wildlife. Give them a wide berth. Looking SE from the trail. Natural arch near Mundy's Gap Road. A view along Lower Sunset. Looking west at bottom of trail.